Description: Whether you want to "paint" with fiber or create your own free-form woven wall hangings, this is the place to start! You'll learn how to create diagonal and curved shapes and to place them where you want them using meet and separate to dovetail two colors together and vertical slits to create adjacent blocks of color. With these tapestry basics under your belt, you'll be well on your way to weaving anything you can imagine. 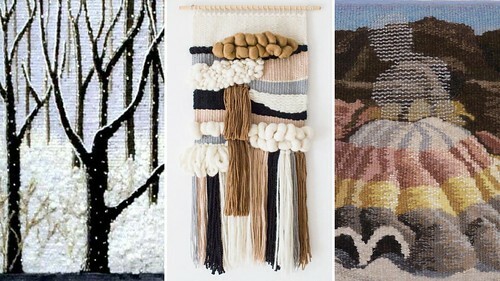 Nancy Dugger has been a weaver for over fifty years, concentrating on tapestry for the last ten years. She exhibits her work in Tapestry Weavers South shows and has also been juried into exhibitions sponsored by the American Tapestry Alliance and the Chattahoochee Handweavers Guild. Nancy weaves primarily for her own enjoyment, and she loves teaching others the art of weaving tapestry. Experience Level: No prior weaving experience required. 8-dent Wee Weaver Loom (optional) - Purchase and bring your own to continue weaving at home after the class or use a SEFAA-provided loom during class. Supply Fee: $8, payable to the instructor at the beginning of class for yarn and handouts. Registration and Payment: See below. If you have trouble registering or paying (Safari users!) or if you are concerned that this website does not have an https address, please use the following direct link for registration and payment: https://sefaa.secure.force.com/Programs/CnP_PaaS_EVT__ExternalRegistrationPage?event_id=a0u0V00000ZcpFPQAZ. If you prefer to register and pay by mail, click here to print a registration form.